Here’s the block designed by Dalton and Eveleigh for E E Hewson in 1910, built at a cost of $36,000 by Baynes and Horie. It was at least the second building the architects had designed for Mr Hewson – they designed another on ‘West Hastings between Cambie Street and Abbott Street’ in 1906. 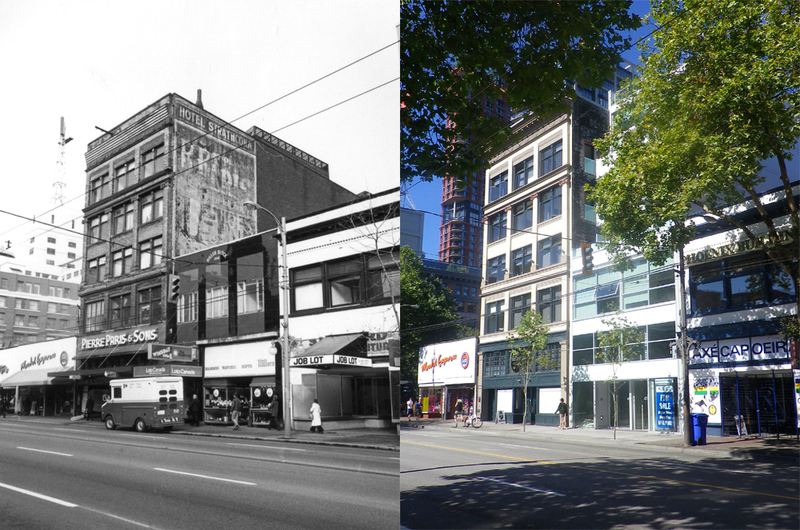 They also designed $1,200 worth of work for Mr Hewson at 120 West Hastings in 1913 – which confirms that was the earlier building – (it is still standing, and called the Golden Crown today). The Richards building was called the St Regis (before the St Regis Hotel was built) – and seems to have been rooms rather than a hotel. When we first posted, E E Hewson was something of a mystery – there’s no sign of anyone with that name in BC in any census around the turn of the century. Although Dalton and Eveleigh’s entry in a 1913 biography refers to them being ‘architects to the Hewson estate’, it doesn’t mention any other information about any Hewsons. We know there was an E E Hewson who was Vice President of the Hinton Electric Company in Vancouver – because in the year the St Regis was built he wrote rather cryptically to the Hon W L Mackenzie King against the introduction of an 8-hour work day, but that wasn’t the developer. There was also another E E Hewson who was a partner in a huge woolen mill in Nova Scotia – but there was no obvious link we could find to Vancouver. We’ve recently been able to confirm through a family contact that he is the original owner of 712 Richards. Edgar Ellis Hewson was a barrister as well as an industrialist who apparently was always looking for an investment opportunity. Initially it was thought possible he invested in Vancouver because of family connections in California where there is a branch of the Hewson family, although there were also relatives in Winnipeg. However, we now have a more likely connection. E E Hewson was born in 1870 in River Philip, Nova Scotia and died in 1957 in Amherst, Nova Scotia. He built his home in Amherst in 1907, a gorgeous Queen Anne revival mansion, which is a provincially registered heritage property. Baynes and Horie built 712 Richards and William Horie’s family also came from River Philip, a small rural community, so that seems to be a likely link between Mr Hewson and Vancouver. This building started life as the Traveller’s Hotel, as it was in this 1923 image. It only acquired the Metropole name when the original Metropole, which was on the other side of the street, was swallowed up by the ever-expanding Woodwards store in 1924. The Travellers was built in 1910 for Dr R C Boyle at a cost of $45,000 and was designed (like so many of the city’s buildings at the time) by W T Whiteway. Dr Boyle was an active developer, but continued working as an MD as this 1909 cutting shows. He seems to have arrived in Vancouver around 1900, initially living at 811 Thrlow Street and in 1903 at 1076 Robson Street. He was born in Ontario, but trained in Manitoba at the Medical College, then had a practice in Morden (where his daughter Mildred was born) before the family moved on to BC. In the 1901 census he was aged 32 and living with his wife, Margaret, (apparently known as May), his five year old daughter, Mildred, a servant, Annie Davis, and his sister, also called Margaret. Dr Boyle’s wife was also born in Ontario, (in Ottawa) but Annie was from England, By 1911 the family had grown with the addition of 10 year old Bidwell – who must have been born within days of the 1901 census, and 3 year old Edward (who had been born in England). Annie has gone, replaced by Mary Smith who had just arrived from Scotland and 17 year old Nellie Stephens acting as nurse. (Nellie had arrived from England aged five). In 1903 the doctor had Bedford Davidson build four frame dwellings in the 1100 block of Thurlow at a cost of $6,400 and another four on Broughton Street. In 1904 Davidson built a $6,000 home for the doctor on Robson Street designed by Honeyman and Curtis. After the hotel was built, in 1911 Dr Boyle appears to have been the joint developer of 1023-1027 Granville Street, a Parr and Fee designed hotel (The Royal) costing $60,000. He was First Vice-President of the General Securities Co, capitalised at $300,000 in 1911 and active as brokers and bankers in the Lower Mainland. The Boyle family was active in the city’s life. The Ladies Musical Club was formed in the Boyle home in 1910, and Mrs Boyle was also a member of the Imperial Order of the Daughters of the Empire. In 1906 Dr Boyle was part of a large group of dignitaries from western cities (including Seattle and Tacoma) who toured California by train to identify opportunities for greater development of the north west. 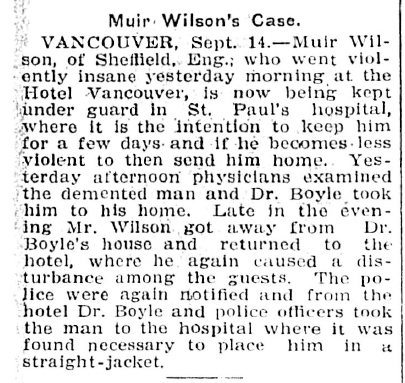 Dr Boyle died in 1935, and a rather inaccurate obitiary in the Winnipeg Free Press (wrong age, wife identified as neing from Winnipeg) suggests two of three of his brothers also headed to BC, to Penticton and Revelstoke, with another in San Francisco. At the time of his wife’s death in 1955 aged 86, her daughter was living in Seattle and her sons in Eugene and Portland, although two sisters were living in Vancouver. Today the Metropole, like many of the remaining early hotels in the Downtown Eastside, is a single room occupancy hotel. Today, this is the St Regis Hotel – as it was in the 1940 when this image was taken. The building acquired the St Regis name as a hotel in 1913. It started life proposed as “apartments/rooms” to be built at a cost of $85,000 to W T Whiteway’s design for Leon Melekov. The initial description of the building in July 1912 said it would be 2 storeys, with offices on the second floor, but designed to have a further three storeys added later. By August the local newspaper was reporting that the building was going to be five storeys from the outset and costing $100,000, and by September there was a further floor to be added at a cost of an extra $20,000. It was originally going to be called the Standard Building, presumably reflecting Melekov’s position as Managing Director of the Standard Trust & Industrial Co Ltd.
Leon Melekov was Jewish, and almost certainly born in Russia – possibly in 1874 (at least, that’s what most census records show – later in court and in one census he claimed to be a British born Russian). His wife Mary was born in Germany. They probably arrived in Vancouver in or around 1902. He seems to have had extensive business interests but his main position was as Vice-President of the British Columbia Refining Company Limited, one of only four refining oil companies in Canada at the time (and the only one in the west), with a facility in Port Moody. By 1911 Leon was well established with his wife, two daughters, Rose and Martha, and their servant, Joy Robinson. (Martha was aged 10 months, and had been born in BC, but Rose, who was eight, had been born in Germany). Melekov was pursuing other opportunities – he was head of a $500,000 consortium proposing to create the BC Steel Corporation to be based in Coquitlam, but that didn’t happen. Instead Melekov started visiting the US (he already looks to have had some business interests there as a director of a Michigan theatre, apparently run by a brother). There are almost no references to the Melekovs in any profiles of the time, although they were important enough to be noted when they stayed in other cities. However, Leon must have helped support the Vancouver legal profession substantially, as there are numerous claims and counter claims where his name appears in court cases, often in connection with investments where he was acting as a broker. Whether it was one of these cases, or more likely the significant economic slowdown that accompanied the First World War, by 1920 Melekov was in California where he was listed as Secretary of the General Investment Co, with an office in the Van Nuys Building in Los Angeles. He built a home to his own design close to Wilshire Boulevard in 1922. In the 1930s he was President of an Oklahoma City based oil company, the Donleon Refining Co, although he seems to have done that from Los Angeles. That all went very wrong when he was accused of embezzlement (but was not found guilty), and he then attempted to counter-sue. His attempt to pursue further litigation entered the legal textbooks when the case was not brought to trial as the Oklahoma based parties he was pursuing were served papers in California – thus negating the entire case against them. Much later – in 1953 – Melekov wrote a book about the petroleum industry – “The Greatest Fraud Ever Perpetrated in America” He died in 1963, still in Los Angeles. 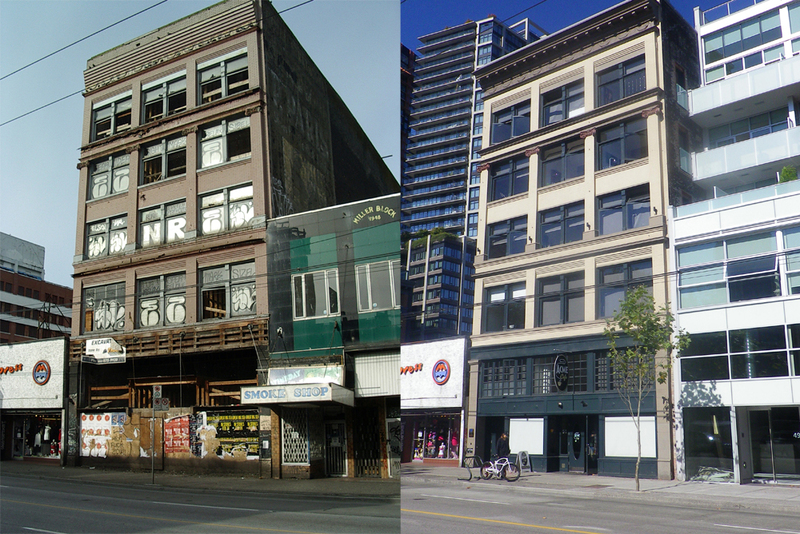 In 1907 Hooper and Watkins designed the Eastern Building on West Hastings Street, although there seems to have been a 1908 permit as well. Although the Statement of Significance on the building says it was initially an apartment building, the 1908 and 1909 Street Directories shows a fur company, replaced a year later by a real estate company on the second floor, along with the Northern Club, and W A Clark, another real estate broker on the third floor. John F Deeks developed the building, but in 1909 Burton & Jackson, props. of the Strathcona Hotel carried out the conversion to a hotel (although Mr Deeks owned the building until at least 1917). John and his wife Minnie had been in the city since at least the turn of the century; both coming originally from Ontario (John was born in Morrisburg, and was photographed as a competitive cyclist in the Toronto Wanderers team in 1893). John’s father, George, had been born in England but his mother was also from Ontario. John was born in 1868, 1869 or 1870, depending on which census you look at. The Deeks seem to have had a t least two children, Marion, born in 1903 and George who died very soon after his birth in 1905. John was a successful hydraulic miner, finding gold at Pine Creek in Atlin in the early years of the century and selling out to the North Columbia Gold Mining Company in 1904. In 1909 R T Perry designed $15,000 of alterations to the building for Mr Deeks (a substantial sum in those days, suggesting significant changes to the building). With these changes, by 1910 it had become the Strathcona Hotel, while a shoe store (initially Starks, and later McKeen’s) had the ground floor. Pierre Paris moved into the main floor in 1919, offering “Corrective Footwear Made to Measure” along with high grade shoe repairing. In 1913 W D Woods, obtained a permit to carry out repairs to the hotel. (As Mr Deeks still owned the hotel in 1917, Mr Woods may have been an agent, or possibly another operator of the hotel). It stayed as a hotel for many years; the Paris company closed down in the 1970s (soon after our 1978 image was taken) – although family members are still in the orthotics business elsewhere in the city. John Deeks died in 1935 and Minnie in 1937. Next door the Miller Block was built-in 1947, and part of the seismic support for the heritage building includes the adjacent new Annex building by Gair Williamson, also by Salient. As our image here shows, by the early 21st Century the building was in poor condition. Although in theory a Single Room Occupancy Hotel, in practice nobody had lived in the building since 1974. After two other owners, and several false hopes for refurbishment, a permit was issued in 2006 to allow a comprehensive renovation of the building by Gair Williamson for Salient Developments, completed in 2008. The Acme Cafe moved in downstairs and 29 condo units were created on the upper floors. Here’s the Louvre Hotel as it looked in 1889 (the year it was built), and what’s left today. This somewhat anonymous building in the 300 block of Carrall Street has been the home of the Gospel Mission since the 1940s. The Mission has been in operation in Vancouver since 1929 and is one of the oldest missions in the city. The image shows the building’s first tenants at street level, the Vancouver Drug Company run by Dr. James Rolls and the Vancouver Tea and Coffee Company whose manager is listed as W A Cumyow. The 1889 Directory lists a Louvre Hotel as being on Pender Street – this building wouldn’t become the Louvre for a few more years. Won Alexander Cumyow was the first Chinese born in Canada, in Port Douglas at the head of Harrision Lake. He was secretary of the Chinese Consolidated Benevolent Association when it was founded in Victoria in 1884 and later its president in Vancouver. Cumyow would later become a court interpreter for the Vancouver Police and while in Vancouver he helped form the Chinese Empire Reform Association to promote the modernization of the Chinese monarchy. He worked in a variety of businesses including real estate and retail. The Tea and Coffee company moved out and was replaced by a Robertson’s Men’s Furnishings, Hats and Caps. In 1891 Arthur Haines opened his real estate office next to the drug company and took rooms upstairs. Haines would remain in the building for the next six years. In 1896 the Brown Jug Saloon replaces the drug company and is renamed the Louvre the following year when Reinhold Minaty moves over from the Old Fountain Saloon on Cordova Street. Minaty advertised the Louvre as having the only circular bar in the province and suggested customers “call in and lubricate”. The wall in the lane (once known as Louvre Alley) still features painted signs for the saloon and advertises clean beds for 20 cents a night at the Boston Rooms a few doors down the lane. The rooms above the store fronts seemed to be operated as a rooming house until 1898 when they are listed as the Louvre Hotel. Fire insurance maps of the period show the hotel had six fireplaces when it was built. On the ground floor a variety of businesses including cafes, confectionary stores, barber shops and tailors come and go over the years. In 1940 the old Bijou Theatre next door to the hotel was torn down and, for some reason this included the demolition of a section of the Louvre Hotel that faced onto the CPR right-of-way at Carrall. It’s at this point the hotel disappears from the directories and when the Gospel Mission moves in. The Bijou may have been designed by James Donnellan (it was rebuilt in 1913 by Donnellan and Stroud) and for some reason his name appears (wrongly) as the architect of the Louvre on the city’s Statement of Significance. One possibility for the correct architects are Mallandaine & Sansom, who designed a block for Alderman McConnell on Carrall Street in 1889.